Fans of Vince Guaraldi and the music of the Peanuts television specials might have thought that after releasing a newly remastered version of the A Charlie Brown Christmas soundtrack in 2012 (which was preceded by a different remaster in 2006, which was preceded by the original CD release in 1988), that Fantasy Records might take a year or two before releasing another edition of the classic holiday soundtrack. They'd have been wrong. 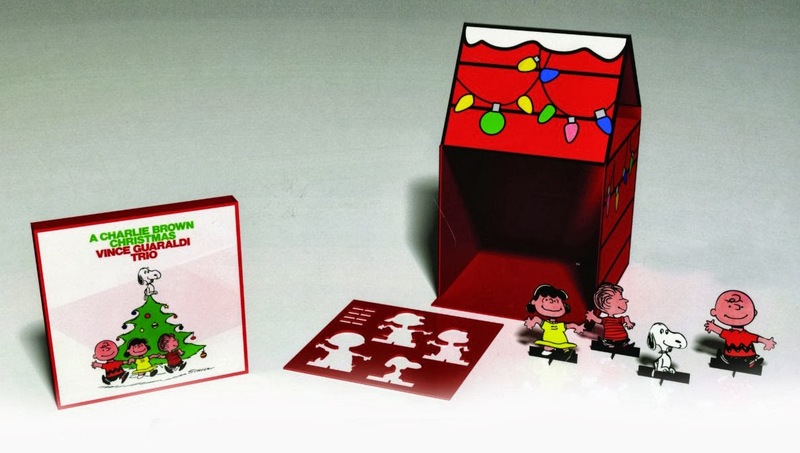 On October 22, 2013, Fantasy released what they are calling A Charlie Brown Christmas (Snoopy Doghouse Edition). The CD contents are exactly the same as the 2012 remaster - the same tracks, the same remastering, the same booklet with liner notes by Vince Guaraldi expert (and my FiveCentsPlease.org colleague) Derrick Bang - but this version comes with special packaging that converts into a doghouse and includes little standup cutouts of Charlie Brown, Snoopy, Linus, and Lucy (see the picture below). On YouTube, Concord Records (owner of the Fantasy label) has posted an "unpacking" video that gives a better idea of how the packaging works. If you already have the 2012 release, there's no need to get this one unless you're a completist. But it might make a nifty gift if you're planning on giving the CD to someone else... which is probably what Fantasy is hoping you'll think! The "plain" 2012 CD release remains available as well, and is slightly cheaper, so you can save a few bucks if you don't want the special doghouse packaging. For more commentary on this new CD release, see Derrick's post at the Impressions of Vince blog. Meanwhile, the soundtrack isn't the only A Charlie Brown Christmas item to get a re-release this year. Lee Mendelson's book detailing the creation of the 1965 TV special, A Charlie Brown Christmas: The Making of a Tradition, has been reissued with a new cover. The contents are otherwise apparently the same as the previous hardback and paperback editions. Scott, Where can I get the Thanksgiving theme that has the trumpet solo? This is played at the end of A Charlie Brown Thanksgiving. Is this even available? Thank you for nay help. Yes, the version of the Thanksgiving theme with the trumpet solo is available. You can find it on the album "Vince Guaraldi and the Lost Cues from the Charlie Brown Television Specials Volume 1" (which also includes music selections from There's No Time for Love, Charlie Brown; You're a Good Sport, Charlie Brown; and You're Not Elected, Charlie Brown). It looks like the CD itself may be out of print, but the track or album are available as a digital download from Amazon or iTunes.